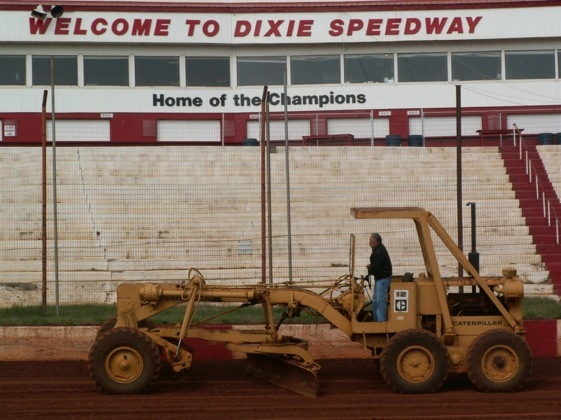 Dixie Speedway is almost always getting some loving care from its owne, Mickey Swims. First opened in 1969 as a dirt track, it was paved for a time in the early 1970s and then converted back to dirt. Racing legend Bud Lunsford and long-time car owner Max Simpson were among the early owners and operators. For the greatest part of its existence, Dixie has been operated by the Mickey Swims family. Every Saturday night during the racing season, drivers show up with their cars washed, polished and tuned to perfection, in search of the often-elusive checkered flag. Most aren’t professional racers. They’re everyday Joes, salt-of-the earth people, just like the fans who come to witness the action. It’s a scene repeated at countless short tracks across America every weekend the weather’s fitting. Like many of those tracks, Dixie Speedway is at the core, a mom-and-pop business. Mickey Swims and his wife Martha, the long-time owners, raised their children, Mike and Mia, at the track. Today, a son-in-law and a daughter-in-law, and now grandchildren, are part of the business, though the family is still struggling to deal with the loss of Mike to cancer in September, 2007. Mike Swims gained national recognition with the creating in 1990 of the Hav-A-Tampa Dirt Racing Series, which later became the United Dirt Racing Association. The two organizations led the way in bringing dirt racing to a national TV audience. It’s said that behind every successful man is a successful woman, and that’s particularly true for the Swims family. Martha Swims, though she usually works behind the scenes, is as big a part of Dixie’s success as anyone. She’s handled the business end of things on race nights, and in her own quiet way helped her family and Dixie Speedway develop a reputation nationwide for their integrity and character. If anyone ever deserved the title of “First Lady of Auto Racing” it’s Martha Swims. Atlanta Motor Speedway president Ed Clark can attest to the reputation of Dixie and the Swims family. “If you mention their names anywhere in racing, people totally respect them for what they’ve done and for their character,” Clark said, adding that it’s exceptional for any family business to be successful as long as the Swims have been and even more unusual for it to come in the challenging field of racing promotion. He said the Swims’ secret is in their passion for what they do. “They’re a family that loves doing what they do,” he said. Over the years, some of the most talented drivers have raced at Dixie. Some like Jody Ridley, Bobby Allison and Richard Petty also were stars of NASCAR racing. Others like Scott Bloomquist, Billy Moyer, Larry Moore and Chub Frank achieved national renown as dirt racers. Perhaps the most famous Dixie alum is NASCAR champion Bill Elliott. “Dixie is where it all started for me,” Elliott said. “I ran Dixie when it was dirt in ’73, and then they paved it between ’73 and ’74 and that’s when I won my first race. Elliott said he likes the fact that Dixie is still going strong after all these years. “It seems like a lot of the race tracks we grew up to know are going by the wayside, but Dixie is still right there,” he said. Dixie Speedway has had more than its share of dramatic moments over the years, some on the track and some off. Track owner Mickey Swims said one of the best decisions he ever made was plowing up the asphalt surface after the 1976 season. He also helped his business by signing on with the late Robert Smawley when he formed the National Dirt Racing Association in 1978 and started paying $10,000 to win Late Model races. “That was unheard of back then, but it was the ke y to the growth of dirt track racing,” Swims said. “He pulled in cars from everywhere and had high-caliber drivers like Leon Archer and Buck Simmons traveling with him. One of the all-time best events at Dixie was the 1995 Hav-A-Tampa Shootout. Most of the nation’s top dirt racers were on hand, and Swims surprised them all by plowing up the upper groove after Friday’s qualifying events. On Saturday night, drivers found a smooth lower groove and an extremely rough, but very fast upper groove. Bloomquist, who had won the two previous Shootouts, kept his car down low and led most of the race. Bill Frye, from Batesville, Ark., had run rough tracks successfully in the past and seized the opportunity. “Bill Frye got up in the high groove and drove from the back to the front,” Swims said. “Once he took the white flag, he never cracked the throttle and beat Scott Bloomquist by three feet. The biggest crowd Swims ever drew came to watch NASCAR icon Dale Earnhardt and native son Bill Elliott square off in Late Model cars. Although the format hinted at little more than a show for fans, both drivers showed up intent on taking the victory. Earnhardt, driving a car prepared by Mike Head, the veteran Atlanta-area racer, convinced the crew to remove some of the required lead from the car, making it lighter and faster. Still he barely beat Elliott. Mickey Swims also is a really good guy, by all accounts. Today, at age 69, he still has a strong passion for racing, even as he continues to deal with the heart-breaking loss of his son who worked side-by-side with him from the time he was barely a teenager. Swims could have taken his business abilities and accomplished a lot elsewhere, as his older brother Ed Swims, a commercial builder, advised him to do years ago. But generations of dirt racing fans can be thankful he stuck with racing, despite the long hours and the hard, dirty work preparing the racing surface each week. He too is glad he made that choice. “I decided a long time ago to hoe the garden around here,” he said. “I wanted to stay home and give race fans as good a show as I could give them and for a decent price. That means more to me than anything. Great story on Dixie. I remember when it was really out in the wilds of GA and hard to get too. Now the interstate and a four lane have brought the city to Dixie (which may not be good). The only remnant of Dixie’s asphalt days is the now seldom used staging lane on the front stretch.